Minneapolis, MN—October 7, 2014—Banner Engineering introduces the WLS28-2 Dual Color LED Strip Lights. Featuring the same durable, low-profile design and efficiency as Banner’s work light strip family, the WLS28-2 Dual Color has been enhanced to offer dual-color operation. This makes the LED light optimal for industrial lighting applications requiring more than one color, such as mobile vehicle illumination, where red light is easier on operators’ eyes in dark areas, and machine status indication, where alternating colors are used to identify error conditions. The WLS28-2 Dual Color delivers a versatile lighting solution, featuring rugged aluminum housings, a space-saving, low-profile design and various lengths from 285 mm to 1130 mm. For increased flexibility, the WLS28-2 Dual Color is available in four models, allowing operators to select from stand-alone cable, stand-alone push button QD, sealed cascadable and lensed cascadable. All models offer enhanced light quality with bright, densely spaced LEDs to ensure even, bright and highly efficient illumination. Consuming very little power at less than 9 watts per foot, the WLS28-2 Dual Color is designed to last more than 50,000 hours of continuous operation with minimal loss of intensity. LED strip lights are offered in six different colors, including cool and warm white, red, green, blue and yellow. With several mounting options—top, side and magnetic—in addition to multiple bracket styles, the WLS28-2 is suited to accommodate various installation requirements. To satisfy demanding environments, the WLS28-2 Dual Color is available in IP67 models and water-resistant IP69K models. An internal temperature monitoring circuit protects the device in extreme conditions, ensuring the light does not overheat. 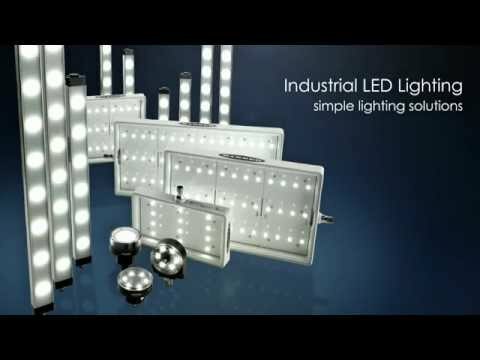 Banner Engineering's industrial LED lights provide a simple lighting solution that can reduce costs, improve product quality and increase efficiency. Our LED lights are bright, durable and have ultra-long lifetimes for greater than 50,000 hours of continuous working life. La iluminación LED de larga duración proporciona más de 50.000 horas de vida útil continua para gabinetes de control industriales o estaciones de trabajo con condiciones de iluminación de fábrica deficientes. Las tiras de luz LED multicolores WLS28-2 con EZ-STATUS® combinan una iluminación brillante con una indicación de alta visibilidad en una lámpara diseñada para su uso en diversas aplicaciones y entornos desafiantes.